Energy drinks were first introduced in Japan in the 60s and became increasingly popular in Europe in the 80s and 90s, presumably due to the rave culture. Soon, energy drink consumption became prevalent worldwide as people began to count on them for a boost of energy. Red Bull, Monster, Rockstar, and Lucozade are some of today’s most popular energy drinks. People rely on energy drinks to get them through a challenging day, perform better at sports, pull all-nighters to study, or even party harder. Energy drinks have become the go-to solution to overcome fatigue, beat daytime sleepiness, and increase performance. However, because the main ingredients in energy drinks are caffeine and sugar, the effects are temporary and not quite so beneficial. And because energy drinks contain such high amounts of sugar and caffeine, there is a rising concern about the effects they have on the body. 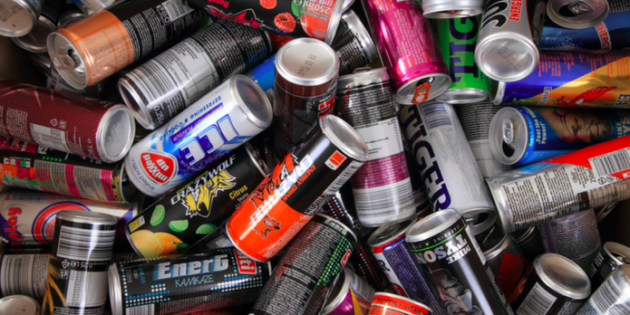 How hazardous is energy drink consumption? The American Heart Association recommends no more than 36 grams of sugar per day for men. A 500ml bottle of Lucozade contains an alarming 62 grams of sugar. That’s twice the daily sugar recommendation. Monster Energy contains 57 grams of sugar, and a 473ml bottle of Red Bull contains 51 grams of sugar and 151 mg of caffeine. Sugar not only causes weight gain, but it increases your risk of heart disease and diabetes. And while sugar does spike blood sugar quickly along with insulin levels, resulting in increased energy, a sharp drop in energy levels is sure to follow. Energy drinks also contain high levels of caffeine. And while caffeine has its perks, it also poses health problems. Side effects of excessive consumption of caffeine include migraines, nervousness, insomnia, muscle tremors, and irritability. Caffeine also affects people differently. Factors like genetics, age, body mass, and health conditions determine your sensitivity to caffeine and the adverse effects that come with it. But caffeine is also very addictive, so regular consumption does tend to take away your power and control over yourself under any condition, and this reduces feelings of satisfaction from life. From messing with your sleep to spiking your blood pressure, and leaving you feeling less in control over your life, consuming energy drinks lead to a slew of health problems.The problem with energy drinks is that people become dependent on them, not drinking them in moderation to the point of excessive consumption. Research studies are also looking at the connection between energy drinks and arthritis and a higher risk for stroke. It’s true that energy drinks give people that jolt of energy when they need it. However, I recommend avoiding these drinks entirely, but if you must, drink them in moderation.